I’d like to play right field for the Cleveland Indians. Both have an equal chance of happening. 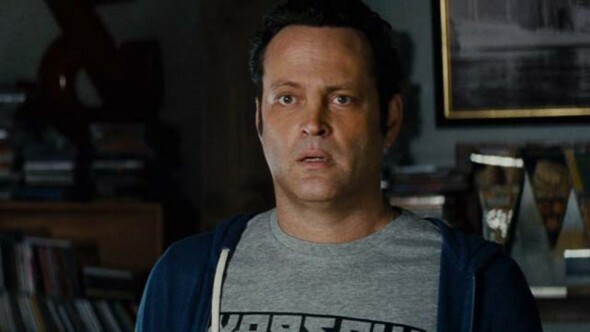 Delivery Man is director/co-writer Ken Scott‘s near shot-for-shot remake of his 2011 French Canadian release Starbuck, and it casts Vince Vaughn as David, a NYC slacker who learns that, in about nine months, his 534th child will be born. Seems that years ago, David earned quite a bit of money doing quite a bit of manual labor at a sperm bank. Through some unethical misappropriation of bank “funds,” he is the biological father of 533 people, many of whom have banded together for a lawsuit in hopes of overturning confidentiality agreements and learning their father’s identity. At the same time, David’s long-suffering girlfriend Emma (Cobie Smulders) announces she’s pregnant, and so it’s time for an absurdly manipulative lesson on the importance of family. Check that, the importance of fathers, as the mothers of all these sperm bank kids are barely an afterthought. The funny thing is, it’s not even funny, as the film focuses instead on exploiting your soft spot for family bonds during the Holiday season. David gets a file with bios of many of his kids, so he begins acting as a “guardian angel,” dropping by incognito to instantly solve a young women’s drug habit or to be the caring soul a severely disabled boy has always needed. If there is a heartstring available, Delivery Man tries to pull it. Vaughn’s usual crutches aren’t the problem. For the first time in a long time, he doesn’t just do the Vince Vaughn schtick, and appears interested in actual acting. Trouble is, there’s nothing of substance for Vaughn, or us, to cling to. The film never seems more than a weak collection of sitcom moments, rendering Delivery Man little more than an empty carton of schmaltz.